Setup Maker Software is an intuitive and good looking installation interface to build setup package of your software by just spending few moments. Customizable windows installer eliminates your countless installation headaches by providing simple and secure way of generating a flexible setup file (executable file) of your software. The idea behind the creation of setup software was to solve complex setup installation problem for software developers who want to make their project scalable all around the world, as installation packages are supposed to be last but not the least step in developing software applications. Thus we invented a Setup installshield that compiles bundle of all your crucial data and patch files and finally converts it into a setup file for running your program overall internet market or while business deal. Note: You have nothing to loose. Test it today and discuss the power of product having sound obvious and standard features. To get familiarize with our product download Setup Maker Software by easy online payment. Incredible ease: We offer you a convenient setup installer that helps in creating setup packages with the attractive and user friendly interface. Minimized complexity: Setup wizard takes only few minutes for being familiar with the program while creating first software setup. Comprehensive Uninstall Feature: You can easily de-install your software setup when it would be not required for a long time. Customized Dialog and Path Wizard: Windows setup builder gives you flexibility for adding various options on demand like including License Agreement, Launching Shortcut icons etc. Registry Information: EXE installer allows professionals to submit Sub key value, Sub key name etc.). Fast and Secure: Smaller code length contributes to quick downloading and also user is given with the choice of providing save file path while storing generated setup file. Compact Installation: Simple setup file installation tool contains smaller code size comparison to other lengthy coded exe installer. 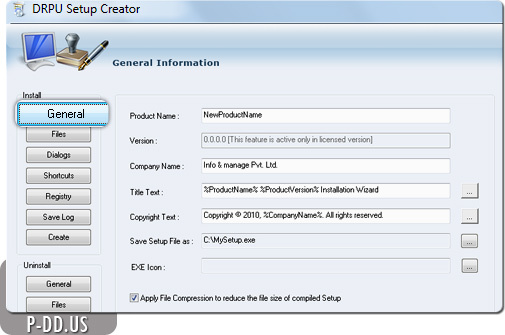 Setup package installer allows establishing parameters for installation process thus supporting all major windows platforms. A complete professional setup generator solution experiencing your business needs.